Nadine Gault, Ben Sempy, Harry Mathers and Lyndsey Watt. Picture by Freddie Parkinson. 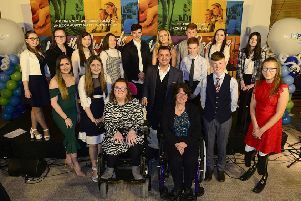 There was glitz and glamour as pupils from Ballyclare High School staged the school’s annual formal. The gala event was held on Friday, November 17 at the Crowne Plaza Hotel in Belfast. Bethany Stewart, James Montgomery, Arianna Clements and Benjamin O'Brien. Picture by Freddie Parkinson. Principal Dr Michelle Rainey and staff of Ballyclare High School. Picture by Freddie Parkinson. Amy McCullough and Lui Hurson. Picture by Freddie Parkinson. Rebecca Hunter, Storm Coates, David Baxter and Rebecca Smyth. Picture by Freddie Parkinson. Megan Erwin and Ben Claxton with friends. Picture by Freddie Parkinson. Mr Michael Nutt with Adele McCafferty, Jasmin Reid, Aimee McKee and Amy McCullough. Picture by Freddie Parkinson. Adam McQueen and friends pictured at the Ballyclare High School Formal. Picture by Freddie Parkinson. Ellen Hall, Kerry Cloke, Sarah Briddle and Emily Walker. Picture by Freddie Parkinson. Rebecca McGreevy, Cameron Keys, James Braithwaite and Lara McWilliam. Picture by Freddie Parkinson. Rachel Black, Adam Clarke, Alice Jordan, Adam Campbell, Emma Hutchinson and Matthew McCullough. Picture by Freddie Parkinson.